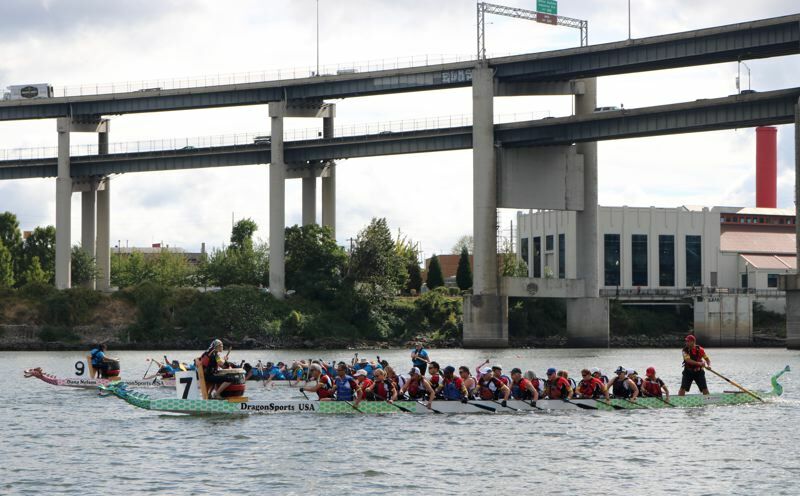 The racers coil between the gray pillars of the double-decker Marquam Bridge. 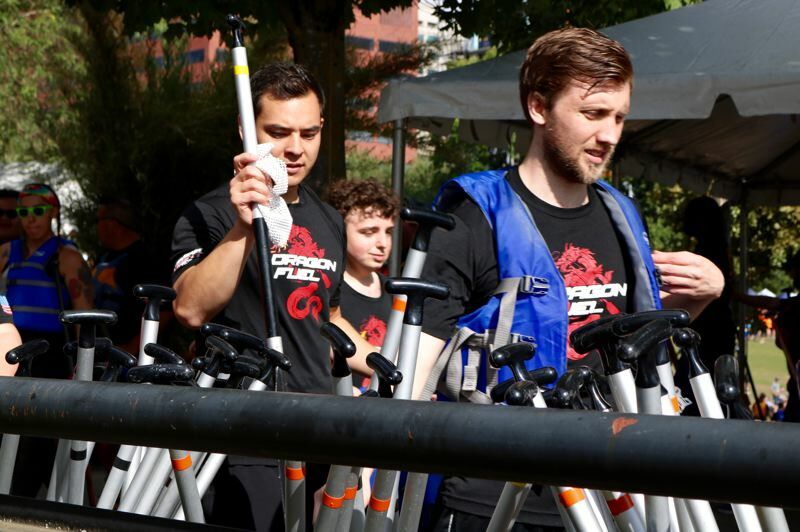 A herd of motorists on Interstate 5 have no idea there are dragons clustered down below. The rowers' goal? A line of orange buoys bobbing in the water roughly 1,640 feet away. When they move, it's like a well-oiled machine or an aquatic centipede. Their paddles flash, splash and gleam in unison. The air horn blasts — a noise soon replaced by the thud of a boat's big bass drum and the "hoo! hoo! hoo! reach!" of a second-place team aching to close the gap. It's all over in two or three minutes. Back on shore, a chorus testifies to the fellowship created when these beast-like boats conquer the waves. "We say there's 20 paddlers. There's really only one," says Colleen McLaughlin, a coach. "It's like a Zen moment," explains Kaspar Murer, a team president. "I'm in the middle of an inspiration community," laughs Ed Noyes, who's getting his feet wet at his first-ever competition. 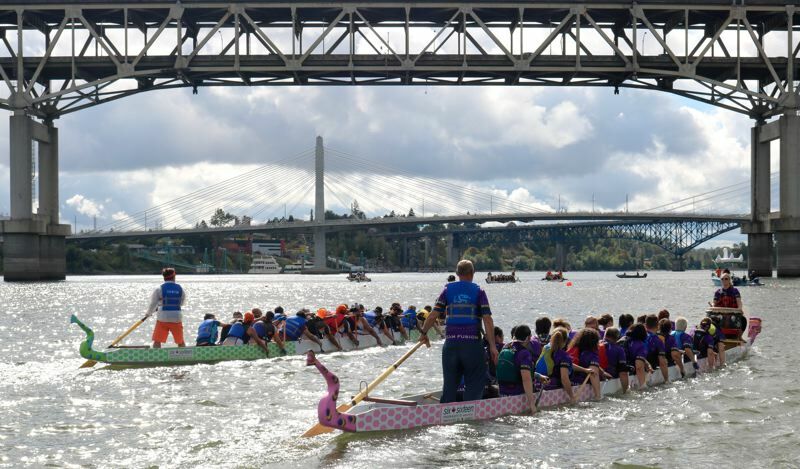 Some 2,000 contenders churned the Willamette River and countless supporters and spectators gathered on the "beach bowl" at Tom McCall Waterfront Park during the 2018 Portland Dragon Boat Race, a two-day event starting on Saturday, Sept. 8. The four-way races pit teams of 22 — 20 paddlers, a drummer calling out the time up front and a tiller in the rear — packed like sardines in a 45-foot boat. The dragonhead bow and the snake-like stern are inspired by a Chinese custom that dates back about 2,300 years. McLaughlin has paddled, coached and called out the beat for the Golden Dragons since her 62nd birthday, a few years after she retired from the city's Bureau of Emergency Communications. Now 75, she's never gotten over the synchronicity of the sport. "Races are won and lost in a hundredth of a second. It's a blink," she says. "When everyone is together, it's like magic." Noyes, who jokes he's "chronologically gifted," is a three-month newbie on the same team, which is designed for people age 50 years or older. "It's an absolutely great way to get the morning started," he says. 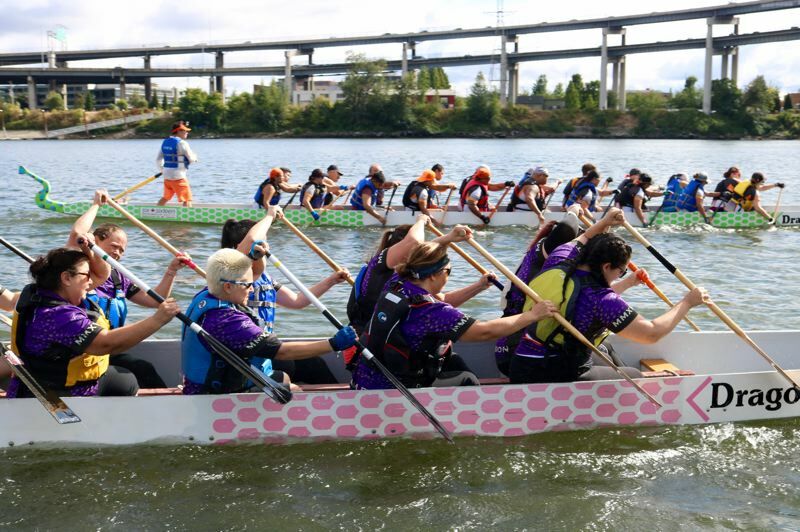 Barbara Hampson rows for the Wasabi Paddling Club on a crew designated for cancer survivors, though members say anyone can join and even want to snare a reporter as their newest recruit. Hampson — an eight-year survivor of an adenoid cystic carcinoma — says practicing is fun, because everyone on the team shares common experiences. But nothing tops the excitement of the big race. "You learn to use the adrenaline," she says. "You know you're at your very best."